Divest from Fossil Fuels, Invest in Climate Jobs! The conference will be held at Sheffield College, which is an accessible location close to Sheffield train station. 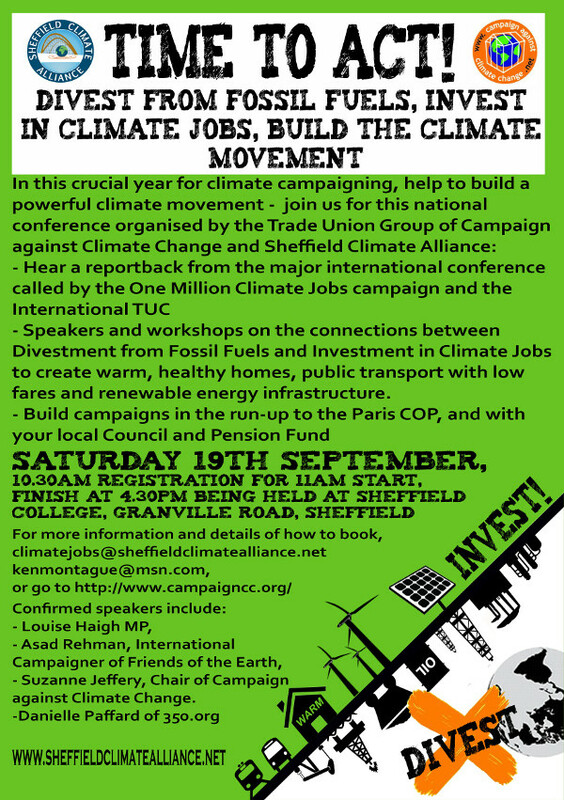 The event is supported by Sheffield Trades Union Council and Sheffield People's Assembly. This event is ideal for anyone who wants to see a real alternative to austerity, unemployment and fuel poverty. It will highlight the importance of training for new jobs to tackle climate change, and the significance of divestment for a safe future, especially for the youth of today. There is a registration fee of £10, and concessions are £5. Suzanne Jeffery, Campaign against Climate Change – Building Time to Act! John Hilary, War on Want – What is TTIP and how can we oppose it? Open Space for small group discussion of your questions and proposals. If you're coming by train, make your way to the tram lines, which is signposted and is the opposite direction of the main entrance. Coming out of the door, turn right and keep to the right side of the tram tracks walking ahead. You will come to a traffic light crossing, cross over and continue, you will see the college building ahead as it is a big building with wind turbines. Walk up the drive, past the nursery and through to the main entrance. You will be greeted by the guard on the main desk, after signing in he will direct to you to the dining room where the conference is taking place. If you are coming by bus from somewhere else in the country, it is very likely you will arrive at or very near to the Sheffield Bus Interchange. There is a walkway leading from the interchange to the train station, if you struggle to find it ask one of the members of staff to point you in the right direction. Then walk through the train station to the tramlines and follow the other directions (Train) to get to the college. See college link below for bikes, scooters and motorcycles.